The City’s Director of Water and Wastewater Nick Benkovich is facing a new round of allegations for violation of human rights, discrimination against gender, and reprisal. Benkovich’s human resources coordinator Vicki Baronette is also a respondent to the application. As per usual, Benkovich hired a lawyer; Mireille Khoraych from a Toronto legal firm but paid for the services with tax dollars. Khoraych’s legal firm in Toronto bagged millions of tax dollars and this continuous waste of public funds must be stopped. Furthermore, the workplace inequality and authoritarian style of management on Benkovich’s behalf has created huge unrest in his division and a large number of those employees are on stress leave especially in comparison to other divisions of the City. This "cost of human capital" is totally neglected by Kevin Fowke, Director of Human Resources, and the cost is relentlessly passed on to the taxpayers. To make matters worse, the labour and employment legal expenses are on the rise and Fowke’s incompetence is exposed once again. Additionally, the Tribunal’s vice chair, David Muir, differed the matter pending the outcome of the internal grievance procedure and requested that the matter be brought forward before the Tribunal once a decision is reached. (Citation 2014 HRTO 1174). Wikileaks Sudbury has uncovered and exposed many scandals including those concerning the misuse of tax dollars. As such it is evident that the City of Sudbury is facing a serious corruption crisis as a large amount of tax dollars have been scammed and misspent. Upon noticing Sudbury’s unsettled political state, the City’s bureaucrats decided to take full advantage. The Sudbury election was addressing major issues such as open municipal government, accountability and value of tax dollars. The City Auditor general took a leave of absence from his position and entered the mayoral race giving Sudburians more hope. During this time, WikiLeaks Sudbury made a strategic calculation and identified possible threats to civil liberty. Paid News The City’s bureaucrats continually engage in attacking Bigger and media outlets are heavily depending on advertisement dollars to attack Bigger as a part of their kick back program. WikiLeaks Sudbury henceforth immediately exposed the connection between the City bureaucrats and paid news. WikiLeaks Sudbury revealed that the Sudbury tabloid newspaper -Northern Life’s City hall reporter Darren MacDonald is under the bureaucrats’ pay roll and warned public to be more cautious concerning articles written by MacDonald. MacDonald was heavily engaged in discrediting Bigger’s campaign. His report: Candidates accuse Bigger of misrepresenting their campaigns, involved negative campaign strategies. However the results clearly indicate that the negative campaigns are not effective on gaining popular votes. WikilLeaks Sudbury had also immediately countered the MacDonald report and provided clear and concise definitions of the negativism. MacDonald along with the City’s corrupted bureaucrats did not stop campaigning against Bigger. Pollsters clearly indicated that Bigger was leading the mayoral race. However in order to create uncertainty, as part of their campaign, MacDonald highlighted that over 39% of voters were undecided. Even then, MacDonald’s campaign did not yet stop. 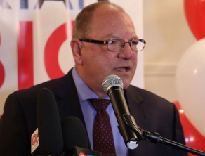 soon after the chamber of commerce debate, he further reported that Bigger’s popular votes were 30% and that his rival Melanson’s was at 28.5%. He also established further uncertainty by stating that Melanson was gaining ground. But in actuality, Melanson and Ridrigouz were continually losing ground and Bigger was gaining. Immediately following this, WikiLeaks Sudbury countered MacDonald’s bogus statistical analysis. The Public was made aware of the real situation and warned against Macdonald’s biased reporting.Finally after defeating all conspiracies Bigger earned 43.22% of popular votes. Sudburians have now elected their mayor. The new mayor must from this point forward work together with the council in the best interests of taxpayers. In order to obtain the best value for tax dollars, a full clean up of the TDS is required. If Bigger and the Council fail to clean the TDS, Sudbury will continue to be a second-class city and will be in continuous danger of decline. The article initially published on International Review of Administrative Sciences, 69(2), 161-172 . Excerpts and review of the article as follows. Even while proposing enthusiastically the attractions of the self-confident organization as the model of the future, the very recent work of researchers also begins from an acknowledgement that ‘management by fear is still the norm in most organizations as it is the easiest and often the most comfortable way to manage’. In the face of this stubbornly enduring, fear-based organizational environment, what realistic chance is there for the sustainable development of the relative newcomer to the scene, the so-called self-confident organization? Most English language dictionary definitions of ‘confidence’ include a mention of concepts around certainty, reliability and trust. For researchers, it is this latter ingredient, trust that is the key to building the self-confident organization, which is one that has moved away from repressive authoritarianism, but stops short of total laissez faire. Structures, rules and lines of authority continue essentially to exist but are clearly articulated, reasoned and prioritized, thereby enabling the organization’s operational experience to be one about which all participants feel positive. So, self-confident management offers, its proponents assert, very clear advantages. It is notable, however, that this 21st century model still retains a central role for the chief executive officer as the singular arbiter of the core values of the organization. Few successful organizations have chosen to divide the leadership role; and they also express concern that the pendulum may swing too far away from the authoritarian models. Even within the ‘participative employee environment’ of the self-confident organization, management sets the agenda and ‘employees fully understand the parameters within which they operate and can trust their employers to stand by these criteria’. While urging the move away from fear-based command and control, their self-confident model is no egalitarian utopia. It is perhaps this element — this continuing echo of earlier management theories — which gives a clue to the future. What is needed is perhaps not so much a full transition from command and control to self-confidence, an abandonment of the one for the other, but rather a synthesis of the two, with trust as the catalyst. If this proposition is accepted, then the real challenge for the organizations of today and tomorrow is equipping their managers and their front-line teams with the right tools for each task and the cultural environment in which to develop the skills and the capabilities appropriate to the challenges but without the fear associated with past cultures. Rather than Handy’s lone, isolated chief executive who, trusting no one, does indeed become arbitrary and authoritarian, we should be seeking to establish coalitions, where the existence of trust and self-confidence in the teams allows for the emergence of a single decision-maker when it is appropriate. It can be argued that, here too, there developed tensions between the authoritarian approach of the centre and the perceived laissez faire approach at the local level — between central and local direction, on the one hand, and democratic participation at the community level, on the other. And, as with the private sector studies, the debate continues within the literature on government. It seems now that in recent years the notion of governance, as outlined earlier, may have begun to lose its prominence and, whilst it remains relevant when considered in the context of local problem-solving, it is beginning to be challenged by a resurgence of support for the importance of national government. Although the fragmentation of public administration may be seen as a response to the more de humanizing aspects of globalization, paradoxically the apparent rise of public support for the more centralized national government also comes from the excesses and tragedies of globalization. Whether coming from central governments, funding institutions or from the communities themselves, the demand for greater participation by local people has become identified as the key to the future of local democracies across the world. If governments, whether local or central, are to continue their hold upon the moral high ground of democratic legitimacy, they must surely seek to adapt to these aspects of change management with more success than observers have so far claimed for their commercial counterparts. It has been argued previously that what may be needed is not so much a total abandonment of command and control in favour of self-confident management but rather a development of self-confidence, based fundamentally upon levels of trust that allow the selection of the appropriate management techniques for each organizational challenge. The consequent changes of political and professional leadership had brought people into positions of power who were eager to introduce new ideas and attitudes. Corporately, the Council had suffered severely in terms of a loss of self-confidence and of public trust and was in no position to resist widespread demands for change. There is far greater clarity and consistency in the messages that we send to others and a demonstrable willingness to listen to, and act upon, those that we receive in return. In consultation with others, city Council has established clear organizational values and goals — its vision of the City’s future is expressed in terms of improving the quality of life for its residents. In summary, our first key learning points have been as follows. Take time building trust and capacity. Be prepared to use varied approaches. Listen to, and act upon, responses received.